Adrienne Zoe is a fine art photographer and bird photographer. Her signature fine art work is creative photography in which she explores light and reflections, creating vibrant images that look like abstract art or paintings. An artist at Uptown Gallery Waterloo, she shows photographic art there year-round. She also exhibits at other galleries and shows. She has taken workshops from master photographers Sharon Milstein and Leona Isaak, and photography courses at Brookdale Community College in New Jersey. As a former member of Vancouver’s North Shore Photographic Society, she reached their highest star rating. 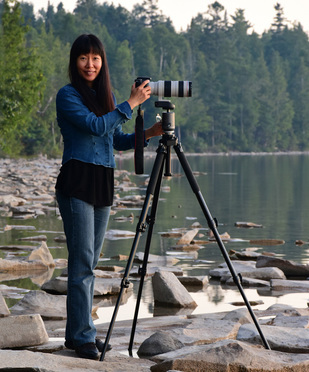 She is now a member of Grand River Imaging and Photography Society, Canadian Association for Photographic Art, Kitchener Waterloo Society of Artists, and Button Factory Arts. Ethereal Wings, accepted for international exhibition by the 123rd Toronto International Salon for Photography in November 2016. Killbear Night Sky, accepted for international exhibition by the 123rd Toronto International Salon for Photography in November 2016. Ethereal Wings, accepted into Beaux-Arts Brampton’s juried Wild life and Native Show in September 2016. Sweet Dreams, accepted into Beaux-Arts Brampton’s juried Wild life and Native Show in September 2016. Autumn’s Palette, selected for Art that Moves You. This is a publicly funded (Region of Waterloo Arts Fund) Button Factory Arts’ project, promoting the arts through displays of art and writing on Grand River Transit buses. Autumn’s Palette will be displayed throughout the month of May 2017. Don’s “Pond”, accepted for international exhibition by the 122nd Toronto International Salon for Photography in November 2015.